These glazed carrots are made with a simple mixture of brown sugar and butter. The brown sugar and butter mixture creates a sweet and beautiful glaze. The carrots make a delicious side dish, and it's one of our most-requested holiday side dish recipes. Serve the carrots with a ham or pork dinner, or add them to your Thanksgiving, Christmas, or Easter dinner menu. Light brown sugar was used in the pictured dish, but feel free to use either light or dark brown sugar. The water evaporates as the carrots cook, leaving them perfectly glazed with a sweet brown sugar coating. Wash the baby carrots under cold running water. Combine the carrots with the butter, brown sugar, and water in a medium saucepan. Stir to blend the ingredients thoroughly. Bring the mixture to a boil over high heat. Reduce the heat to medium-low and continue boiling (uncovered) for about 20 to 25 minutes, or until carrots are tender and the liquid has evaporated. Check and stir frequently to avoid scorching. Add more water, as needed. The liquids will boil down and the water will evaporate, leaving the carrots cooked and nicely glazed with the brown sugar syrup. Season the carrots to taste with salt and pepper. 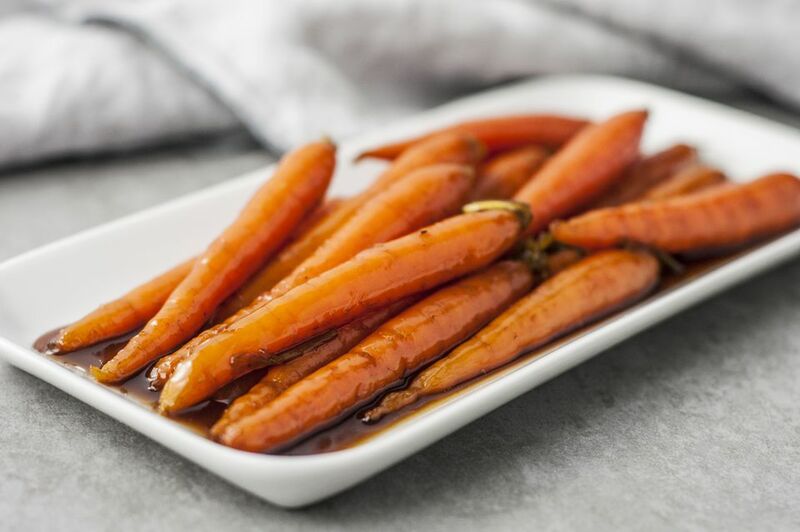 If you'd like to use honey instead of the brown sugar, try this recipe for honey glazed carrots instead. It's another excellent option!